The defending-champion Brandon Wheat Kings were without F Nolan Patrick for a second straight game against the host Medicine Hat Tigers on Saturday. The Wheat Kings, 7-2 losers in the opener, also added a pair of 15-year-olds — D Braden Schneider and F Ben McCartney — while taking out F Baron Thompson and F Cole Reinhardt. Schneider was the 11th overall selection in the 2016 WHL bantam draft, while McCartney was taken in the second round. The Tigers, meanwhile, added veteran D Ty Schultz, while scratching D Brad Forrest. Schultz hadn’t played since Jan. 13 when he suffered a broken leg while blocking a shot. The Red Deer Rebels and the Hurricanes got their series started last night in Lethbridge. The Hurricanes had F Matt Alfaro and F Zak Zborosky back after both had played just one game since March 4. Both were acquired from the Kootenay Ice near the trade deadline in the hopes they could provide some offence. The Tri-City Americans added F Vladislav Lukin to their scratches prior to Game 2 against the host Seattle Thunderbirds on Saturday. He joined F Nolan Yaremko and F Michael Rasmussen. With Rasmussen’s season likely over thanks to a broken scaphoid, losing Lukin is a blow. Lukin finished the regular season with 58 points, including 26 goals, in 63 games. He missed some time late in the regular season, too. After losing Game 1, 4-0, to the Rockets in Kelowna, the Kamloops Blazers inserted D Devan Harrison and F Brodi Stuart, while taking out D Dan Gatenby and F Jackson Shepard. The Regina Pats, who beat the visiting Calgary Hitmen, 5-2, in Friday’s opener, got F Nick Henry back from a one-game WHL suspension. Henry was one of the Pats’ five 80-point men, finishing his first regular season with 81 points, including 35 goals. . . . 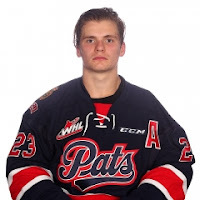 In order to get Henry in, the Pats took out F Kjell Kjemhus, a 15-year-old from Grande Prairie, Alta., who was a fourth-round selection in the 2016 WHL bantam draft. In Everett, the Victoria Royals, 4-2 losers to the Silvertips on Friday, scratched D Scott Walford and F Blake Bargar, adding D Mitchell Prowse and D Jeremy Masella. It’s a big hockey day in Prince George today (Sunday). The Cougars are at home to the Portland Winterhawks for Game 2 of their series at 5 p.m. Earlier in the day, at 9:45 a.m., the Cariboo Cougars and Greater Vancouver Canadians will decide the B.C. Major Midget Hockey League championship. The Canadians won Game 1, 3-2, in double OT on Friday, with the Cougars. behind 19 saves from G Marcus Allen, tying the best-of-three final with a 2-0 victory on Saturday afternoon. When the Winterhawks and Cougars met Friday, it was a Mega Jackpot for the 50/50 draw and Jenny Plouffe, who is from Prince George, went home with more than $42,000. Proceeds from the draw went to Big Brothers, Big Sisters of Prince George. F Ty Ronning of the Vancouver Giants is with the Hartford Wolf Pack, the AHL affiliate of the NHL’s New York Rangers, on an ATO. He picked up is first professional point on Friday, in a 3-1 loss to the visiting Providence Bruins, then got his first goal Saturday in a 4-3 victory over the visiting Bridgeport Sound Tigers. At Lethbridge, the Red Deer Rebels erased a 2-0 deficit en route to a 4-2 victory over the Hurricanes. . . . This was Game 1, with Game 2 scheduled for today, 6 p.m., in Lethbridge. . . . The Hurricanes finished second in the Central Division, 14 victories and 22 points ahead of the Rebels. . . . The Hurricanes took a 1-0 lead when F Tyler Wong struck at 13:51 of the first period. . . . F Ryan Vandervlis made it 2-0 at 3:14 of the second period. . . . F Michael Spacek got Red Deer on the scoreboard at 18:42, the late-period goal maybe the most important of the game. . . . F Cameron Hausinger tied the score at 1:55 of the third period. . . . Red Deer F Brandon Hagel snapped the tie, on a PP, at 18:03. . . . F Lane Zablocki added an empty-netter, on a PP, at 19:56. . . . 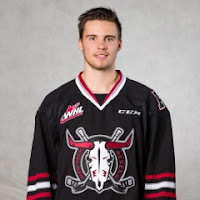 The Rebels to two assists from F Evan Polei and one from Spacek. . . . Red Deer G Riley Lamb stopped 25 shots. . . . Lethbridge got 29 saves from G Stuart Skinner. . . . Red Deer was 2-5 on the PP; Lethbridge was 0-6. . . . Announced attendance: 4,118. Brayden Burke was benched for nearly 30 mins. He roofed the game-winning goal with 4:11 left. 3-2 MJ. Series tied 1-1. Current Broncos, 3-2. . . . The series is tied 1-1. . . . The Broncos had won Game 1, 2-0, on Friday night. . . . They’ll play Games 3 and 4 in Swift Current on Tuesday and Wednesday. . . . F MacKenzie Wight had given the visitors a 1-0 lead at 8:36 of the first period. . . . 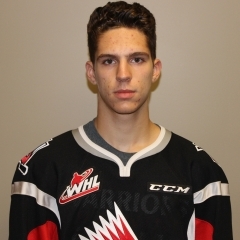 The Warriors tied it on F Branden Klatt’s goal at 13:52 of the second period. . . . Broncos F Tyler Steenbergen scored his second goal of the series at 16:53 for a 2-1 lead. . . . The Warriors pulled even at 5:07 of the third period as F Thomas Foster scored on a wrap-around. . . . The Warriors got two assists from F Luka Burzan. He had the primary assist on Moose Jaw’s first and last goals. . . . G Zach Sawchenko earned the victory with 34 saves. . . . G Jordan Papirny stopped 31 shots for the Broncos. . . . Moose Jaw was 0-3 on the PP; Swift Current was 0-5. . . . Announced attendance: 3,610. 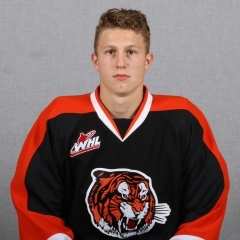 At Medicine Hat, the Tigers built a 3-0 lead and hung on for a 5-3 lead over the Brandon Wheat Kings. . .
. The Tigers won Game 1, 7-2, on Friday. . . . The scene now shifts to Dauphin, Man., for Games 3 and 4 on Tuesday and Wednesday. With the Royal Manitoba Winter Fair having taken over Brandon’s Keystone Centre complex, the Wheat Kings will play their opening-round games in Dauphin. . . . F Zach Fischer gave the Tigers a 1-0 lead with 11.1 seconds left in the first period. . . . F Max Gerlach made it 2-0 at 12:22 of the second period. . . . Fischer increased that to 3-0 with his third goal in two games, at 4:27 of the third period. . . . The Wheat Kings got on the scoreboard when F Connor Gutenberg scored at 7:45. . . . Medicine Hat got that one back just nine seconds later as F John Dahlstrom scored. . . . The Wheat Kings cut the deficit to one on goals from F Reid Duke, at 11:08, and F Tyler Coulter, at 18:09. . . . Dahlstrom iced it with an empty-netter at 19:44. . . . F Mason Shaw had two assists for the Tigers. . . . The Wheat Kings got two assists from F Ty Lewis, with Coulter adding one. . . . Medicine Hat G Michael Bullion made 20 saves. . . . Brandon starter Logan Thompson allowed four goals on 42 shots in 53:12. He left in the third period, favouring a leg, after Tigers F Max Gerlach was pushed on top of him. Travis Child finished up, stopping the only shot he faced in 5:42. That was Child’s WHL playoff debut. . . . Medicine Hat was 1-5 on the PP; Brandon was 0-4. . . . Announced attendance: 3,791. Adam Brooks is cross-checked. No call. Evidently, cross-checking AND slashing are now legal. Why have two referees if they are bystanders? Calgary Hitmen. . . . The Pats had posted a 5-2 victory in Game 1 on Friday. . . . They’ll resume the series in Calgary with games scheduled for Tuesday and Thursday. . . . Last night, Steel, who won the WHL’s regular-season scoring title, drew the primary assist on each of Regina’s first four goals. . . . F Dawson Leedahl gave Regina a 1-0 lead at 11:44 of the first period. . . . Calgary tied it on F Andrew Fyten’s goal at 2:16 of the second period. . . . F Adam Brooks scored his third goal in two games, this one via a 5-on-3 PP, to put the Pats back out front, at 4:17. . . . Leedahl scored again, at 9:38, and F Nick Henry counted at 7:26 of the third period. 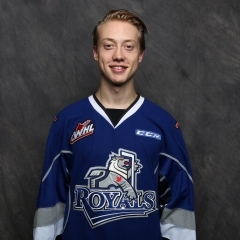 Henry had sat out Game 1 with a WHL suspension. . . . Steel got the empty-netter at 17:00. . . . Leedahl also had an assist, for a three-point night, while D Connor Hobbs had two assists. . . . Regina G Tyler Brown stopped 26 shots, eight fewer than Calgary’s Cody Porter. . . . Regina was 1-3 on the PP; Calgary was 0-4. . . . Announced attendance: 6,484. 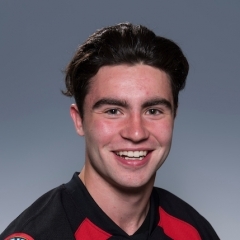 At Kelowna, F Dillon Dube scored two third-period goals for the Rockets as they skated to a 3-2 victory over the Kamloops Blazers. . . . The Rockets blanked the Blazers, 4-0, in Game 1 on Friday. . . . The series resumes with games in Kamloops on Tuesday and Wednesday. . . . Dube, who signed an NHL contract on Friday, scored shorthanded at 11:55 for a 2-0 lead, then made it 3-0, on a PP, at 13:24. . . . D Cal Foote, who also had an assist, had given Kelowna a 1-0 edge at 2:53 of the first period. . . . F Quinn Benjafield scored the Blazers’ first goal of the series at 13:59, and D Ondrej Vala added a PP goal at 16:30 to make for an interesting finish. . . . The Rockets got 33 saves from G Michael Herringer, while Connor Ingram of Kamloops stopped 34. . . . The Blazers had 15 shots in all of Game 1. In Game 2, they held a 16-13 edge after one period. . . . Announced attendance: 5,647.
victory over the Silvertips. . . . Bobylev scored from behind the Everett net, banking the winning goal off G Carter Hart. . . . The Silvertips won, 4-2, on Friday. . . . The teams will resume hostilities in Victoria with games on Tuesday and Wednesday. . . . Last night, Everett took a 1-0 lead on a PP goal from F Matt Fonteyne at 7:53 of the first period. . . . Victoria F Matt Phillips tied it, on a PP, at 12:45. . . . Everett went back out front 49 seconds into the second period as F Patrick Bajkov scored his second goal of the series, on a PP. . . . F Tyler Soy shot the Royals out front with two goals, the first one at 1:40, the second, on a PP, at 7:30. . . . F Brandson Hein pulled Everett even at 7:49 of the third period. . . . F Jack Walker and D Chaz Reddekopp each had two assists for the Royals. . . . Everett got two assists from F Dominic Zwerger and one from Bajkov. . . . Walker set franchise records for career playoff assists (18) and points (31). He had tied F Brandon Magee for both marks on Friday. . . . Soy set a franchise career record for playoff goals (14) with his second goal. The first one tied Walker and Magee. . . . G Griffen Outhouse earned the victory with 18 saves. . . . Hart finished up with 26 saves. . . . Each team was 2-3 on the PP. . . . Announced attendance: 4,196. Americans, 5-2. . . . The Thunderbirds had posted a 4-2 victory on Friday. . . . The series will resume with games in Kennewick, Wash., on Wednesday and Friday. . . . Last night, Seattle took a 2-0 lead on first-period goals from F Nolan Volcan, on a PP, at 8:55, and F Scott Eansor, at 17:14. . . . Eansor scored his first goal since Dec. 31 after missing most of the second half with injuries. . . . 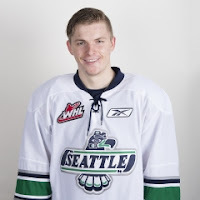 The Americans pulled even on goals from F Parker AuCoin, at 16:21 of the second period, and F Max James, on a PP, at 6:52 of the third. . . . Seattle F Matthew Wedman snapped the 2-2 tie at 15:03 of the third period. . . . F Donovan Neuls added insurance, on a PP, at 15:29, and D Aaron Hyman scored another PP goal at 19:42. . . . Seattle got two assists each from D Austin Strand and D Jarret Tyszka, with Hyman adding one. . . . Seattle G Carl Stankowski, making his second straight start in the absence of the injured Rylan Toth, stopped 28 shots. . . . The Americans got 36 stops from G rylan Parenteau. . . . Seattle was 3-4 on the PP; Tri-City was 1-5. . . . Announced attendance: 4,502.